by exploring the intersection of Jewish wisdom with everyday life. Many of the truths that matter most are brief but powerful. 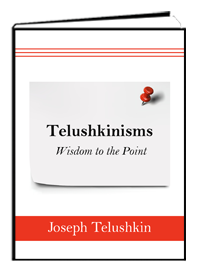 Telushkinisms: Wisdom to the Point by Rabbi Joseph Telushkin can be read in an hour or two, but the lessons it contains – largely drawn from Jewish sources thousands of years old – can bless and enrich your life for as long as you live. What more could one want from a book? 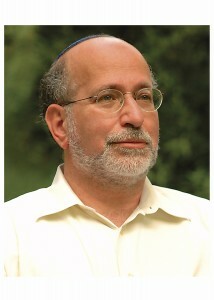 Over the course of many years writing for Aish.com, Rabbi Blech commented on a wide range of topics – from movies to Bernie Madoff to Tiger Woods to the killing of Osama bin Laden. What connects these essays is nothing less than Judaism. The World from a Spiritual Perspective is a collection of essays that explores how viewing the world from a spiritual perspective can uncover new avenues of understanding and elevate our daily lives. For this Mother’s Day it seemed fitting to blend the secular custom of honoring women dear to us on a Sunday in May with the Jewish tradition of blessing these women each Shabbat. 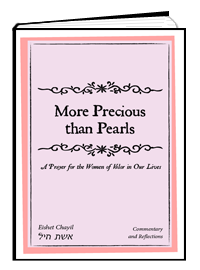 For that reason, we have published More Precious Than Pearls: A Prayer for the Women of Valor in Our Lives. Read this book for free in digital form, send it as a special Mother’s Day gift (also free), or buy the print version from Amazon. We open the High Holidays with Selihot (prayers of penitence) and in the span of two and a half weeks we will have gone through the Yamim Noraim (the Days of Awe). How much of the Yamim Noraim will go through us? 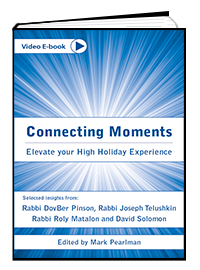 Connecting Moments is a collaboration with some of the world’s top Rabbis and teachers, who, in text and on film, share the secrets to transforming the High Holiday experience. For more than forty years, Rebbetzin Esther Jungreis has written about taking a spiritual approach to solving life’s problems, large and small. 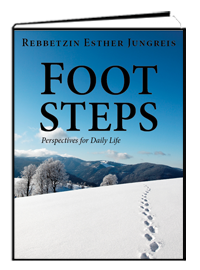 In Footsteps: Perspectives for Daily Life, the Rebbetzin Jungreis speaks to readers directly from the pages, providing universal wisdom on how to live more meaningfully. Life is a journey full of ups and downs, inside-outs, and unexpected detours. 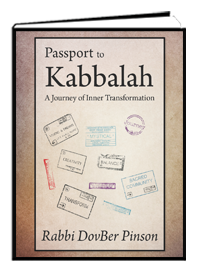 Rooted in the teachings of Kabbalah, Passport to Kabbalah: A Journey of Inner Transformation by Rabbi DovBer Pinson provides readers with a passport of sorts to help them through any obstacles along their path of self-refinement, reflection, and revelation. The hurried pace of our lives and the demands of our daily activities often leave us unable to pursue answers to the profound questions that define our existence and purpose on Earth. 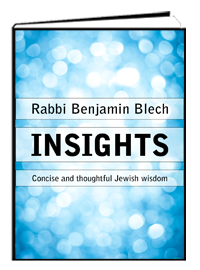 Insights: Concise and Thoughtful Jewish Wisdom by Rabbi Benjamin Blech offers an exploration into some of these fundamental questions. Sinai Live books are relevant, transformative and can change your perspective on everyday life. Life is a journey full of ups and downs, inside-outs, and unexpected detours. There are times when we think we know exactly where we want to be headed, and other times when we are so lost we don’t even know where we are. Often, people get stuck by the idea of a pre-determined destination for this journey called life. They either feel like they are supposed to be somewhere else, or they may feel like they will never get “there.” Both of these perspectives take us out of the eternal moment of the here and now, the transcendent present of presence. But if we read deeply into the inner dimension of the Torah, we are able to see that the true test of life is not where you get to, but how you got there. The point is not, in fact, the destination one reaches, but, more importantly, the journey one embarks upon. The Torah, and its inner teachings, the Kabbalah, are meant to help us navigate this journey called life in the most conscious, caring, and creative way possible. Rooted in the ancient wisdom of the Kabbalah, this book provides readers with a passport of sorts to help them through any obstacles along their path, leading them toward a life of meaning, purpose and self-actualization. For most of us, other people define who we are, and we are left to fill in the details. That is to say that for the most part, other people choose the context of our life, and we choose the content. … But there is another way to live. You can create a life and identity for yourself wherein you are empowered to choose both your context and your content. An interesting thing about prayer is that if you want to make your prayers more meaningful, you have to surrender all ‘understandings’ about prayer. This means that when you pray, you should pray like a child. You can be very complex and interesting when you are trying to understand things, but that should all be prior to the actual act of prayer. Once you pray, there should simplicity. When you only think about the larger picture, it is sometimes hard to see where your life is headed. In Kabbalistic terminology, your life’s meaning is like the Light. Then there are things and situations in your life that are the vessels for this great Light. Certain events or experiences in life seem purposeless. When this happens, you are perceiving more of the vessel of a situation. Everything has both an aspect of light (meaning, purpose, connection) and an aspect of vessel (lack of meaning, purposelessness, separation). Rabbi Pinson is the Rosh Yeshivah of the IYYUN Yeshivah and heads the IYYUN Center for Jewish Spirituality in Brooklyn, NY. He travels extensively and has attracted thousands of loyal followers and students around the world. Learn more at www.iyyun.com. Note: The video-enhanced version is only available for iPad & iPhone. Text versions are available through Amazon and Barnes & Noble. Many of the truths that matter most are brief but powerful. You can read the book itself in an hour or two, but the lessons it contains – largely drawn from Jewish sources thousands of years old – can bless and enrich your life for as long as you live. In addition, practicing the activities described inside will also make you a happier person. What more could one want from a book? Albert Einstein is reputed to have said, “Everything should be made as simple as possible, but not simpler.” In Telushkinisms, Joseph Telushkin supplies concrete suggestions of activities that can be immediately incorporated into your life. Joseph Telushkin, named by Talk magazine as one of the 50 best speakers in the United States, is the author of Jewish Literacy: The Most Important Things to Know About the Jewish Religion, Its People and Its History. The most widely selling book on Judaism of the past two decades, Jewish Literacy has been hailed by leading figures in all the major movements of Judaism, and has been published in a third edition (June, 2008). In 2006, Bell Tower/Crown published the first volume of his monumental work, A Code of Jewish Ethics: You Shall be Holy, a comprehensive presentation of Jewish teachings on the vital topic of personal character and integrity. Richard Joel, president of Yeshiva University, called the book, “a gift to humankind,” and Rabbi David Wolpe hailed it “as a remarkable guide to goodness.” In 2007, A Code of Jewish Ethics won the National Jewish Book Award as the Jewish book of the year. Volume 2 of the Code, subtitled, “Love Your Neighbor as Yourself” was published in 2009 to great acclaim. In September, 2010, Telushkin published Hillel: If Not Now, When? A biography of the great talmudic sage that makes the argument as to why Hillel should emerge as the great rabbinic figure of the 21st century. The book discussed in detail Hillel’s open and encouraging attitude to non-Jews interested in Judaism and in converting. Telushkin is currently writing a study of the life and impact of the Lubavitcher Rebbe. Rabbi Telushkin’s earlier book, Words that Hurt, Words that Heal became the motivating force behind Senators Joseph Lieberman and Connie Mack’s 1996 Senate Resolution # 151 to establish a “National Speak No Evil Day” throughout the United States. In 1997, his novel, An Eye for an Eye, became the basis for four episodes of David Kelley’s Emmy Award-winning ABC TV series, The Practice, and he co-write (with Allen Estrin) three additional episodes of the program. Telushkin was the co-writer with David Brandes and the Associate Producer of the 1991 film, The Quarrel. The film, an American Playhouse production, and the winner of the Santa Barbara Film Festival, was released theatrically throughout the United States. Rabbi Telushkin was ordained at Yeshiva University in New York, and pursued graduate studies in Jewish history at Columbia University. He resides in New York City with his wife, Dvorah Menashe Telushkin, and they have four children. 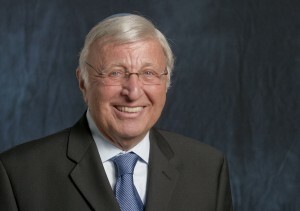 Telushkin lectures throughout the United States, serves as a Senior Associate of CLAL, and on the Board of Directors of the Jewish Book Council. Over the course of many years writing for Aish.com, Rabbi Blech commented on a wide range of topics – from movies to Bernie Madoff to Tiger Woods to the killing of Osama bin Laden – as well as a host of other major and minor noteworthy events. What connects these essays is nothing less than Judaism. And that’s because for me Judaism means looking at the entire world through the lens of a divinely ordained perspective known as the Torah. Judaism isn’t just a religion that teaches us how to relate to God. It’s a way of life that is meant to make us wiser, more contented and better people. This collection of essays explores how viewing the world from a spiritual perspective can uncover new avenues of understanding and elevate our daily lives. “I used to think that the main goal of American business was to make people happy. Create new products so consumers have a better quality of life. Add new bells and whistles to existing technologies to offer a more satisfying experience to the users. “Thinking positively is always the first step to success. Should we ardently wish for things that we want? Of course! Hope fills us with conviction that our dreams are attainable. Desire serves as spur to our initiative. If it is not a magnet, it is at the least a supreme motivator. We should believe in the possibility of acquiring our heart’s desires. But that’s far from saying that there is a universal and unequivocal law that turns every one of our wishes into God’s command. 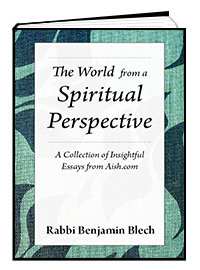 Rabbi Benjamin Blech is an internationally recognized educator, religious leader, author, and lecturer. Rabbi Blech is the author of twelve highly acclaimed and best selling books, with combined sales of close to half a million copies, including three as part of the highly popular Idiot’s Guide series. His book, Understanding Judaism: The Basics of Deed and Creed, was chosen by the Union of Orthodox Jewish Congregations as “the single best book on Judaism in our generation”. Together with an accompanying six hour video, filmed by the producers of 20/20, featuring Rabbi Blech, it is presently being used as the basis for study groups in numerous synagogues and universities around the country. His book Taking Stock: A Spiritual Guide To Rising Above Life’s Financial Ups and Downs was featured in a full page article in the Sunday New York Times and one of his recent works, If God is Good, Why Is The World So Bad? has been translated into Indonesian where it has had a powerful reception in the wake of the country’s tsunami, as well as into Portuguese. In a national survey, Rabbi Blech was ranked #16 in a listing of the 50 most influential Jews in America. A recipient of the American Educator of the Year Award, he is a Professor of Talmud at Yeshiva University since 1966 and has formed thousands of student-teacher relationships through his warm and caring style. A tenth-generation rabbi, Rabbi Blech is Rabbi Emeritus of Young Israel of Oceanside, which he served for 37 years. He is a frequent lecturer in Jewish communities as far-flung as Australia, South Africa, New Zealand, Bangkok, Singapore, Hong Kong, Tokyo and Israel. Closer to home, he has served as Scholar-in-Residence at hundreds of synagogues throughout the United States and Canada and been active on behalf of countless Jewish causes. His lectures on tape have an international following and are among the most popular from among the thousands made available on the web through Aish Hatorah. He is known for his ability to present complicated ideas in a clear and entertaining manner. 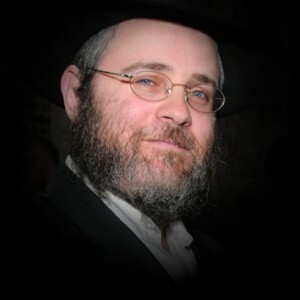 A past President of both the National Council of Young Israel Rabbis, as well as the International League for the Repatriation of Russian Jewry, Rabbi Blech has also served as officer for the New York Board of Rabbis as well as the Rabbinical Council of America. He has appeared on national television (including the Oprah Winfrey Show); hosted a popular weekly radio program in New York; and written for Newsweek, The New York Times and Newsday, in addition to a wide and varied number of scholarly publications. As a result of his personal meeting with the late Pope John Paul II, he was instrumental in securing the loan of precious Jewish manuscripts for exhibition in Israel and he is presently involved in further negotiations for the return of precious Judaica held by the Vatican that may well prove to be of historic significance. Rabbi Blech is an unusually eloquent and gifted speaker, as well as a profound contemporary theologian and religious spokesman, who has made a major impact on the many tens of thousands of people he has addressed. AND MOST RECENTLY: Rabbi Blech’s latest book, The Sistine Chapel: Michelangelo’s Forbidden Messages in the Heart of the Vatican, was featured on Nightline, Good Morning America and a one-hour special on 20/20. The book is divided into concise, impactful chapters such as Purpose, Confidence and Creativity. Rebbetzin Esther Jungreis was born in Hungary and experienced the Holocaust firsthand as an inmate of Bergen Belsen. Following the war, the Rebbetzin devote her life to combating the spiritual holocaust that we are witnessing here in the United States and around the world. Hineni In 1973, Rebbetzin Jungreis founded Hineni, an international movement to inspire the Jewish people to return to their roots. Hineni programs have been held throughout the United States as well as in Israel, South Africa and Australia. In 1982, the Hineni Heritage Center opened its doors at 232 West End Avenue in New York City. Today, the Center offers a comprehensive series of programs and classes on the Torah, Talmud, Kabalah, History, Rituals, Hebrew language, and much more. There is a constant flow of visitors through its welcoming doors, and visitors leave fortified with a knowledge of their roots, and with the desire to learn more. Visit Hineni at www.hineni.org or contact the organization at hineni@hineni.org. Books and Columns For more than forty years, Rebbetzin Jungreis has written a weekly column for The Jewish Press using the Torah as the source for solutions to everyday problems. In addition, thousands tune in for the Rebbetzin’s Life Transforming Weekly Torah Class, which is live-streamed around the globe. Jewish Soul on Fire William Morrow & Company, 1982. Named one of the ten best Jewish books of the year by B’nai B’rith. The Committed Life: Principles of Good Living from Our Timeless Past Harper Collins, 1999. Now in its eighth edition and translated into multiple languages. Speaking and Recognition Rebbetzin Jungreis has been acclaimed by the Jewish community throughout the world, and her outstanding work has been recognized by Hadassah, The Jewish War Veterans, B’nai Brith, Federation of Jewish Women’s Organizations, Knights of Pythias, and the Christian Amita Society. She has been the keynote speaker at the joint convention of Reform and Conservative Rabbis in Palm Springs, and has spoken for the Rabbinical Council of America, O.R.T., Hadassah, U.J.A., B’nai Brith, and many more. She has also been accorded recognition by the State of Israel and invited to address members of the Israel Defense Forces. Her seminars attract overflow crowds. Note: The video-enhanced version of Footsteps is only available for iPad & iPhone. Text versions are available through Amazon and Barnes & Noble. Mark Pearlman’s Rethink Partners is an organization dedicated to shifting user and industry perspectives through a combination of business strategy, product management, sales and marketing, editorial, design and online implementation. Rethink Partners works with for-profit and non-profit organizations to help them reach their potential. We are focused on seeing both what is and what could be. Visit us at www.rethinkpartners.com. Contact us at info@rethinkpartners.com.